I was stunned with a written quote Dee. Quote representing a novel content from PERAHU KERTAS that had long finished my reading. About Kugy, cheerful little girl strange and full of surprises. Has a unique ideals as a fairy tale writer. Pretty, petite, humorous, often called the mother alien because of his indifference to the appearance. Kugy's fashion style is carelessly. Kugy a student one of university at Bandung majoring in literature, which supports the goals though with a circular path first. Have a boyfriend named Joshua or Ojos. Kugy like to send a letter to the god Neptune that he did with a paper boat way to wash away the water flow. Met with Keenan, a talented young painter and inherited his talent from his mother. Keenan's father that his son did not agree to be a painter, did much to stem these ideals. which was behind his father's opposition was a secret past in their family. Both Keenan and Kugy in loved, but they're put to much pride and shame too talk each other about their feeling.. (somehow I thought it just look a like with Korean Drama, isn't it?). Then cause any cases they live separately and separate way they choose makes them no longer seeing each other. The even never met again. But after five years, life become so kind to make them met. They met for a small moment of meeting them again. Meetings that brought a variety of feelings, as well as meetings that brought the lack of space to be together. You can read preview this novel by ebook, you can download it free when you searching it on google. I read it preview before and I thought it's genre around Teenlit at the beginning. But after reading a few chapters, I fell in love. I actually made life and see how two people who love each other can be so hard to unite. Dee concocting a story with a romantic style and her narrative flowing as usual. Again I fell in love with this novel, as I fell in love with the other Dee's novel. Are tou wanna know more? Let's read that book. It's also colorfull and lovable book. so worth to read. cuma pas baca lagi postingannya yg kemaren..hihihi..
subuh2 aku bergerilya lagi di blog mu sobat....ku tunggu kedatangan mu..
hm buka google translate dulu ah!?!?!?! 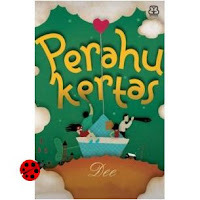 hm ini tentang novel karya mba dee ya.....judulnya "perahu kertas"....jadi penasaran!!!! Oh ini blogmu yg baru ya Nyin? oalah...ternyata pandora box juga anyin toh?? gratisan dikirimin sama temen mbak..
this review make your readers feel what you had ever read.